Ever wanted to own one of James Bond's cars? Didn't win the auction for the classic DB5 last month for $4m? Now is your chance to own one of 007's Aston Martin's, although this one wasn't used on screen. 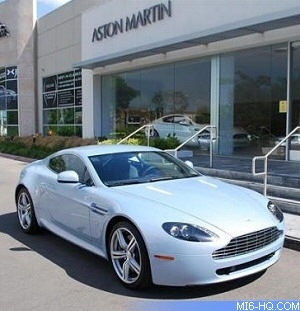 Aston Martin of Newport Beach, CA, are selling a 2010 V8 Vantage Coupe previously owned by Daniel Craig. 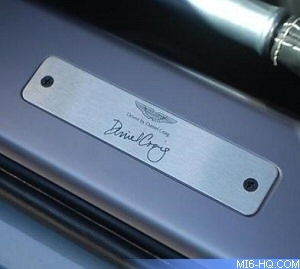 The James Bond actor has even signed the sill plates. The car can be yours for $139,007. N400 Sills, Clear tail lights, rare 6 speed manual. Factory warranty good thru 3/02/2013. Vehicle includes: AM/FM Stereo,Auxiliary Audio Input,Bucket Seats,CD Changer,Cruise Control,Heated Driver Seat,Heated Passenger Seat,Leather Seats,MP3 Player,Navigation System,Power Driver Seat,Power Passenger Seat,Satellite Radio,Wireless Cell Phone Hookup.